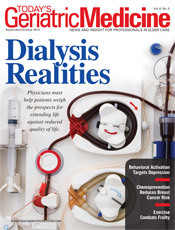 With expectations higher than ever for positive health outcomes, the pressure is mounting for primary care providers, social workers, nurse practitioners, and physician assistants who work with older adults with chronic conditions. However, these providers face significant challenges in delivering health care to their patients, especially among those working with older adults since people older than 65 tend to have complex health conditions and rely heavily on health care services. The complexity of health conditions among those aged 65 and older has increased progressively over time. The prevalence of multiple chronic conditions increases with age. According to a 2010 study by the Robert Wood Johnson Foundation, among Americans over the age of 65, as many as three out of four people live with multiple chronic conditions. The prevalence of chronic conditions presents a complex challenge for the US health care system, both in terms of the impact on costs and a patient’s quality of life. According to a 2004 study by Partnership for Solutions, led by Johns Hopkins University and the Robert Wood Johnson Foundation, the annual health care cost of managing one chronic illness is $2,241; for patients with two chronic illnesses, these costs increase to $4,256; and for those with more than five illnesses, the costs can be as high as $12,689 annually. This stands in contrast to health care costs of $850 for a person with no chronic conditions. Individuals with multiple chronic conditions tend to experience a worse quality of life, use more medications, and visit their physicians more often, and they are more likely to be hospitalized than those without chronic conditions. In 2004, 38% of hospital admissions involved individuals aged 65 and older. It is projected that by 2030, those over the age of 65 will make up 56% of hospital admissions. The Kaiser Family Foundation found that of $2 trillion spent in 2010 on health care in the United States, 75% was attributed to the cost of medical care for people with chronic illnesses. Our population’s health is best served when open communication and care coordination occur across the care continuum, from the acute care setting to the home. Interestingly, acute care has been the focus of readmission penalties for select diagnoses (eg, myocardial infarction, heart failure), yet acute care is not designed to prevent or limit the negative ramifications of chronic illness. In contrast, the ambulatory care setting is better suited to promoting preventive measures and addressing health maintenance. To tackle these strains, health care providers working with older adults can look to several partners for support. In addition to acute care, specialty providers, home health, and hospice, home care agencies can provide services that positively impact the quality of life for individuals and improve outcomes. Physicians can benefit by understanding how they can utilize home care resources to provide comprehensive care to individuals with chronic conditions in a meaningful and cost-effective manner. In-home caregivers can provide the first line of support for older adults living with chronic conditions and their families. In collaboration with primary care, trained home care providers ensure client care coordination and create dynamic person-centered care plans. They provide support for solutions that avoid or limit the impact of chronic illnesses by recognizing red flags that signal the need for health care interventions and by helping people with chronic conditions manage their medications and improve their lifestyle choices. According to many health care experts, including Eric Coleman, MD, a professor of medicine at the University of Colorado, there are four key reasons for hospital readmissions that can be prevented with the help of a home care agency: medication management issues; fall risks; failure to follow posthospital discharge orders, including proper nutrition and prescribed physical activities; and failure to attend follow-up physician appointments. These issues can be managed, provided the individual has the support needed to make appropriate lifestyle choices. A home care agency specializing in chronic care can take the time to fully understand the unique needs of a person living with chronic conditions. The staff then can create an individualized care plan and work directly with primary care providers, home health agencies, and rehab facilities to improve individual health outcomes. Three all-too-common chronic conditions—diabetes, heart failure, and COPD—can be aided by home care services. While many of the services provided are practical, such as monitoring medication, the in-home caregiver also provides emotional support to patients and their loved ones as the patients adapt to the challenges of chronic illness. People with chronic conditions may be more willing to take dietary or lifestyle advice from an objective third party like the trained home care provider or simply appreciate an expert listening to their anxieties about the illness. People with diabetes can benefit from home care services. People with diabetes must maintain a healthful diet in order to control sugar and simple carbohydrate intake. Specially trained caregivers, such as those who receive ongoing training through the Homewatch CareGivers University, can help a patient living with diabetes interpret the nutritional instructions provided by a physician or dietitian. A trained caregiver can assist with shopping by helping an individual find the complex carbohydrate options they can enjoy in place of unhealthful simple carbohydrate foods. Making some basic dietary changes can potentially decrease complications associated with diabetes. People with diabetes also may find themselves at an increased risk of falls, particularly if they experience leg cramping or decreased sensation in their legs and feet. A trained caregiver can help to identify potential fall hazards in the home as well as other safety risks. Since people with diabetes are more likely to suffer from depression, a home care provider can supply emotional support, too. The CDC estimates that nearly 6 million Americans suffer from congestive heart failure (CHF). When a patient has heart failure, he or she feels fatigued and experiences weight fluctuations and other potentially limiting and even debilitating symptoms. However, qualified caregivers can support a high quality of life for people living with this chronic condition by providing everything from diet instruction to medication monitoring and even tips on how to create a safer living space to avoid falls. Patients with heart failure take several medications, such as blood pressure drugs that may cause dizziness or lightheadedness. A trained caregiver can monitor medication intake and alert a health care provider of possible errors in the dosage taken. In addition, a caregiver can provide tips on home safety in the event that the medication or condition leads to symptoms that cause a fall. A reduced-sodium diet can help people with symptoms of heart failure, and a trained caregiver can assist with grocery shopping and healthful meal preparation. Caregivers can encourage those living with CHF, who often experience fatigue, to get the exercise they need. An in-home caregiver acts as a cheerleader, encouraging activity, ensuring frequent rest periods, and finding easy ways for patients to exercise in a safe environment, such as taking a leisurely walk around the block together. As with any chronic condition, it is important that a primary care provider stay involved in the care process and monitors compliance with medical orders. A caregiver can help a person with CHF receive proper follow-up care by providing transportation to and from appointments. He or she can take notes during a physician’s visit and keep the family informed. COPD includes emphysema, chronic bronchitis, and other lung diseases that result in shortness of breath, cough, and severe fatigue. One challenge for COPD patients is using an oxygen mask. Complicated oxygen tubing can create significant fall hazards in the home. However, trained caregivers can teach patients how to stay mobile safely while using an external oxygen source. Though people with COPD have difficulty breathing or experience episodes of shortness of breath (which would seem to preclude strenuous activity), health care providers recommend patients engage in exercise to increase their stamina. Physicians often prescribe pulmonary rehabilitation exercises, and a trained in-home caregiver can supervise and support patients with COPD with recommended follow-up exercises in between therapy sessions. Reliance on oxygen also can make it difficult for COPD patients to perform basic activities, which is especially true when it comes to bathing and showering. Being unable to maintain hygiene independently may cause embarrassment when visiting a physician, leading to a lapse in care. Stand-by bathing assistance or hands-on bathing from a caregiver who understands the impact of a patient’s temporary departure from oxygen can make bathing a safer, more pleasant experience. Consequently, a patient can feel more comfortable attending scheduled physician appointments rather than waiting until there is an emergency. In partnership with health care providers, social workers, and nurses, in-home caregivers not only provide assistance with daily living but also help patients manage their chronic conditions while maintaining a high quality of life. Such a strategic partnership can improve outcomes while decreasing pressure on primary care providers. — Nicole Brackett, LPN, a home care training specialist at Homewatch CareGivers, has more than 22 years of nursing experience in long term care settings, including Alzheimer’s and dementia care.